Social Media and Kids: Are We Asking the Right Questions? Here is an important article by Agence France-Presse (AFP) lifestyle editor Robert MacPherson about questions raised by Common Sense Media founder James P. Steyer concerning the effects of social media on kids. 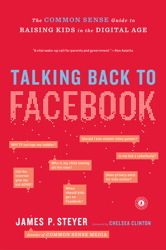 Jim Steyer’s guide is called Talking Back to Facebook (there is a video to check out on this page). These questions can be compared, contrasted, and evaluated alongside those of many longstanding debates about the effects of motion picture media, advertising, video and computer games, and other media on kids, grownups, and everybody else. The topics of this book offer strong discussion points when considering the use of social media in schools and the role of visual media in social and cognitive development. 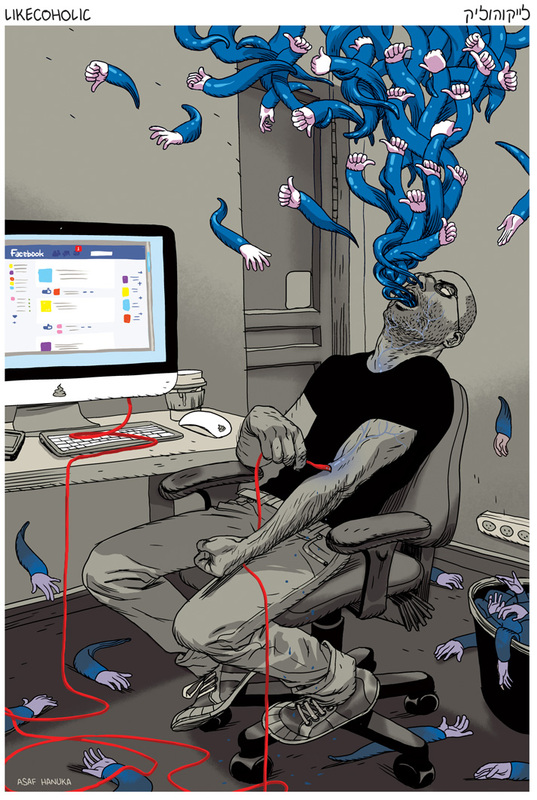 For a rather striking illustration to accompany this post’s theme (I also recommend checking out Sponge Brain), check out the weekly online comics blog from Asaf Hanuka, the illustrator for the cover and splash pages of Moving Images. Hanuka lives in Israel, and The Realist, his weekly comic that explores the emotional, societal, and artistic travails of a nearing-forty artist and father, is exceptional. Earlier in these pages, when discussing Douglas Rushkoff’s A.D.D., I wrote “Graphic novels continue to be one of the most dynamic media around – one of the nice surprises that as the world goes digital, drawing continues to make a comeback in innovation and inspiration – and the relationship between comics and moving images offers boundless potential for visual storytellers and learning scenarios.” I think it would be hard to find a more pertinent or striking short-form, online example of this than in Hanuka’s The Realist visual blog. For those interested in the graphic arts and their myriad intersections with moving images, I encourage you to check out my earlier posts on Saul Bass and Alex Toth. An earlier post in this blog featured the full interview with David Riker, our featured Close-Up Interview from Chapter 5 of Moving Images. Here is an excellent article from the Tribeca website that discusses the Q&A with Riker and producer Tania Zarak after the last festival screening of The Girl, starring Abbie Cornish. 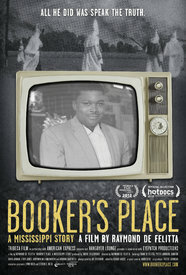 The documentary Booker’s Place: A Mississippi Story opened recently at the Tribeca Film Festival to very strong reviews. This movie directed by Raymond De Felitta concerns another movie made during the 1960’s by the director’s father, Frank De Felitta. The elder De Felitta traveled to Mississippi in 1966 to make Mississippi: A Self Portrait for NBC about the ongoing story of the Civil Rights Movement. On his travels for this piece, he crossed paths with Booker Wright, a man whose life was changed irrevocably by his televised appearance in which he talks about his feelings as a victim of discrimination and racism in the Deep South. For a critical perspective on the movie, this review of Booker’s Place: A Mississippi Story is representative of criticism that has appeared on the movie, and it is quite thorough and eloquent. Also, Democracy Now broadcast a feature story on the content of the movie, and it highlights the moving dialogue between Raymond De Felitta and Yvette Johnson, the granddaughter of Booker Wright, who met because of De Felitta’s initiation of this project. Finally, here is a story from the New York Times that discusses the family tales that intersected in the narrative of this movie. This documentary can serve as an excellent source of study for themes in Chapter 6 of Moving Images, and it is extremely well suited to cross-curricular lessons with social studies courses. The layers of story and the impact of media on history, society, and individual lives are rich with possibilities of investigation for educators and learners. This includes issues of responsibility and the effects of media on the lives of subjects of non-fiction movies as well as those who make them, as discussed in the cases of Barbara Kopple’s Harlan County, USA and Errol Morris’s The Thin Blue Line. Images from PES's "Western Spaghetti." A bunch of very fun and visually striking shorts are available on the aptly named website The Twisted Films of PES. 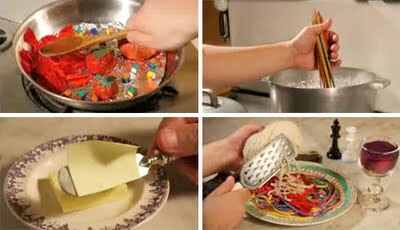 In particular, I would recommend Western Spaghetti, Game Over, The Deep (produced for Showtime), and the commercial Human Skateboard. Here is a recent interview with PES. In this interview, he discusses his use of pixilation; as he explains, this is a method that has been used by filmmakers since the earliest years of cinema. One of the most important examples of its use is the classic short Neighbours, made for the National Film Board of Canada by visionary filmmaker Norman McLaren and featuring fellow animator (and performer) Grant Munro. 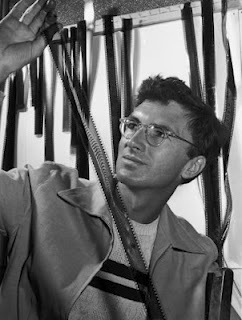 The works of PES and Norman McLaren can offer many interesting examples for educators as they explore questions of film forms that are raised in Chapter 5 of Moving Images. Other examples will be discussed in upcoming blogs: stay tuned!